The journey took us from Ljubljana through Istanbul, before we landed in Bishkek, the capital of Kyrgyzstan. The next few days were spent wandering about town and shopping for food. Already in Ljubljana, one of our backpacks decided not to board the plane with us, but instead went on its own adventure. After three days Turkish Airlines still didn’t have a clue where it was. We were left with no other option but to buy the missing gear and head on. 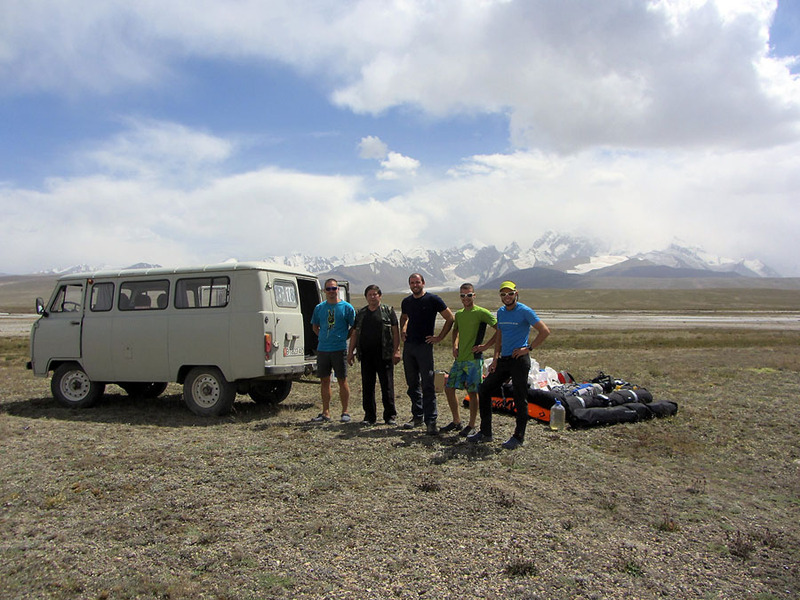 It took us two days driving across half of Kyrgyzstan with an old russian army van and five days transporting our gear on foot before we established our base camp at the foot of Kyzyl Asker glacier. A few days after arriving in base camp Anze, Uros and I went on a reconnaissance trip. We set off on the east fork of the glacier in perfect weather. But, as was confirmed during the duration of our stay, the weather here just doesn’t want to play ball. By the time we reached the ice fall between Pik Gronky and Pik Vernyi it was already snowing. 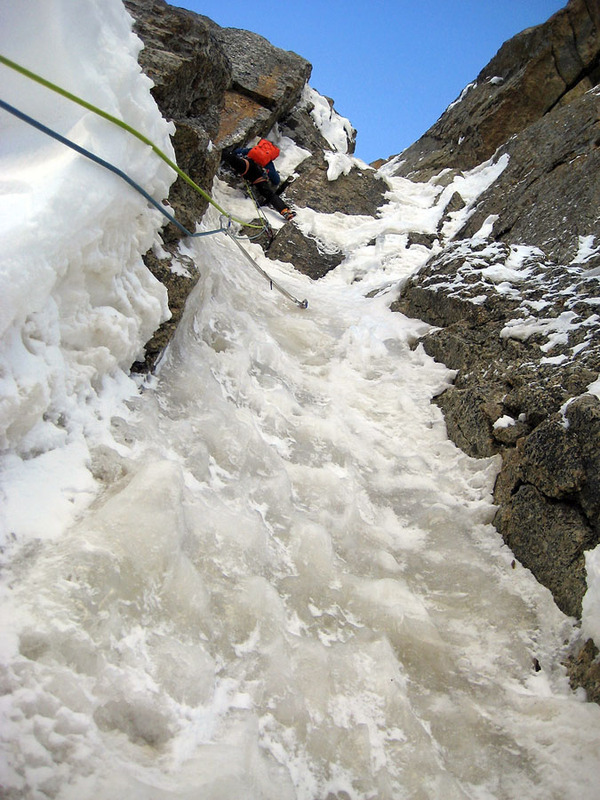 Still we continued towards a nice ice line we had spotted on the west face of Pik Carnovsky. But the weather means business, and by the time we arrive under our chosen line, we are left with no other options but to leave our gear and descend. 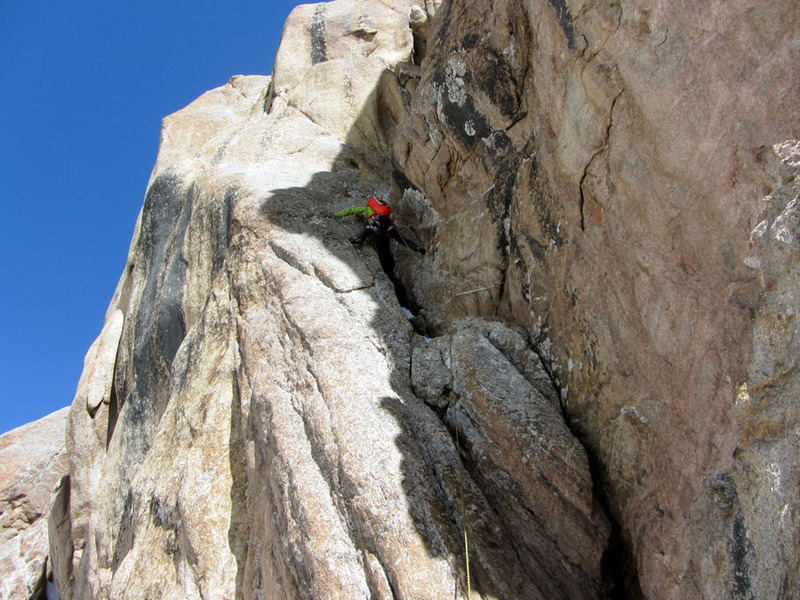 Two days later we try again, but this time we bivy under Pik Gronky. 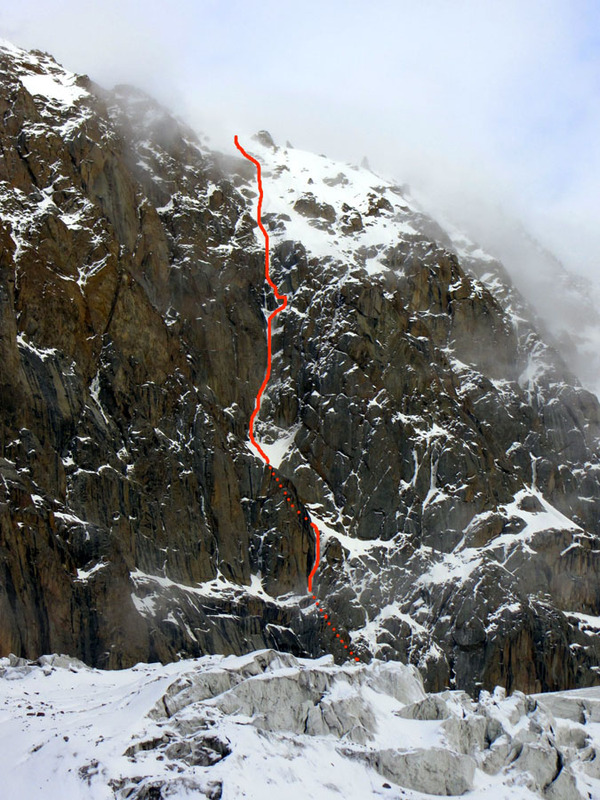 The route requires nine hours of difficult and often, because of bad conditions, dangerous climbing that just goes on and on. Not exactly a warm up route we were hoping for. 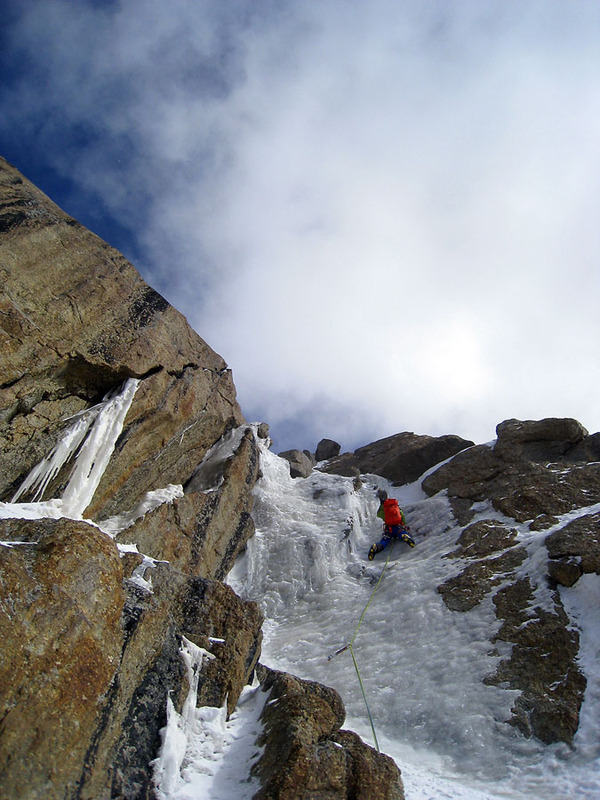 We descend the route by abalakov threads and rock horns. 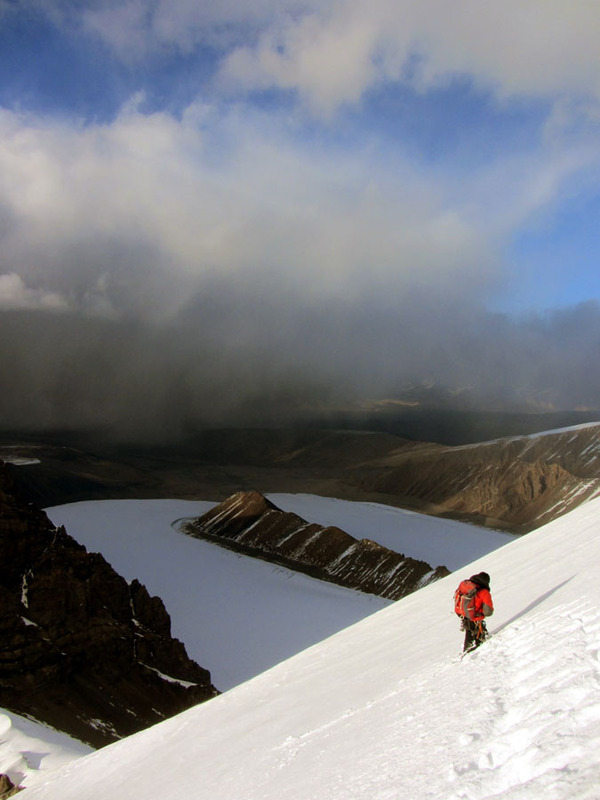 The next day we return to basecamp determined to shift our activity to ridges, as the snow and ice conditions are very bad. 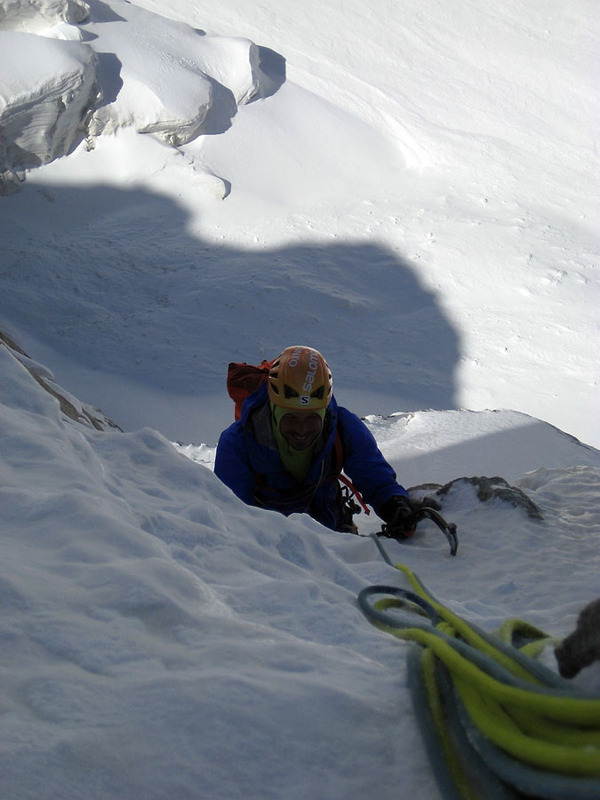 To aid in our acclimatisation efforts we start up a ridge immediately east of base camp. It extends over two minor summits, Pik Beggar, Pik Ecstasy, Pik Yurnos, Pik Gronky, Pik Carnovsky and Pik Zuckermann. The good weather forecast again takes a turn for the worst, so we set up our tents between Pik Ecstasy and Pik Yurnos. 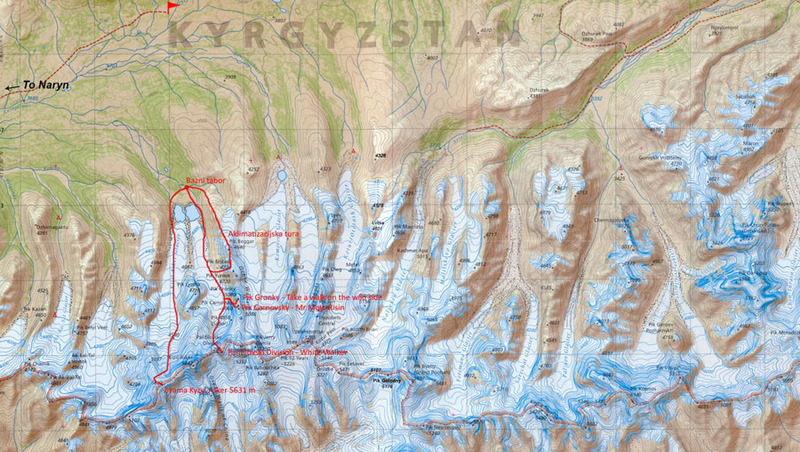 Because of continuing bad weather in the morning, we descend directly towards the east fork of Kyzyl Asker glacier, having achieved our goal of spending the night at almost 5000 m.
After a few days of bad weather, the forecast for the next few days looks promising. Although we have learned so far not to trust the forecast too much, we pack up four days worth of food and start towards the west ridge of Kyzyl Asker. The hike up the glacier takes a lot longer than anticipated. A heavily crevassed area at mid height and deep fresh snow higher up force us to make camp at around 5000 meters although our goal for the day was a col at the beginning of the west shoulder of Kyzyl Asker. The next day we continue up deep snow towards the saddle. 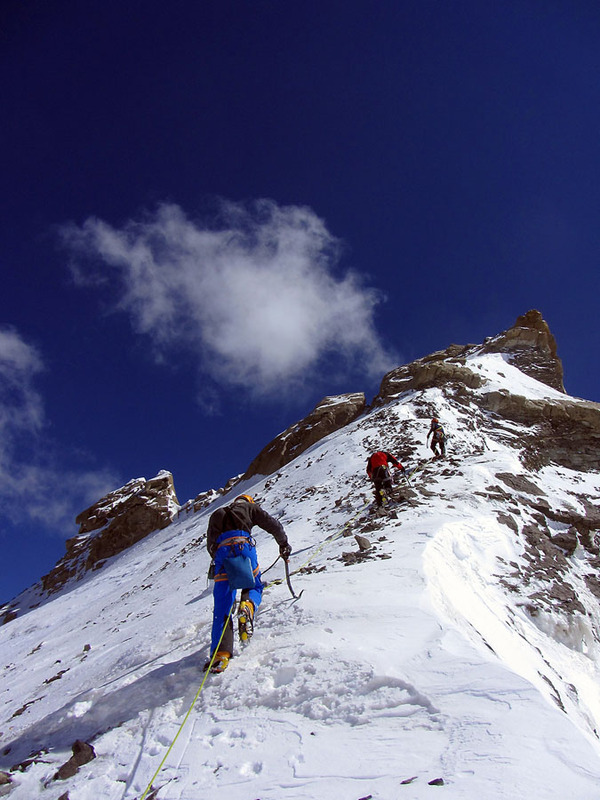 We soon realize that there is too much fresh snow and we are way too slow to make it to the top of Kyzyl Asker. 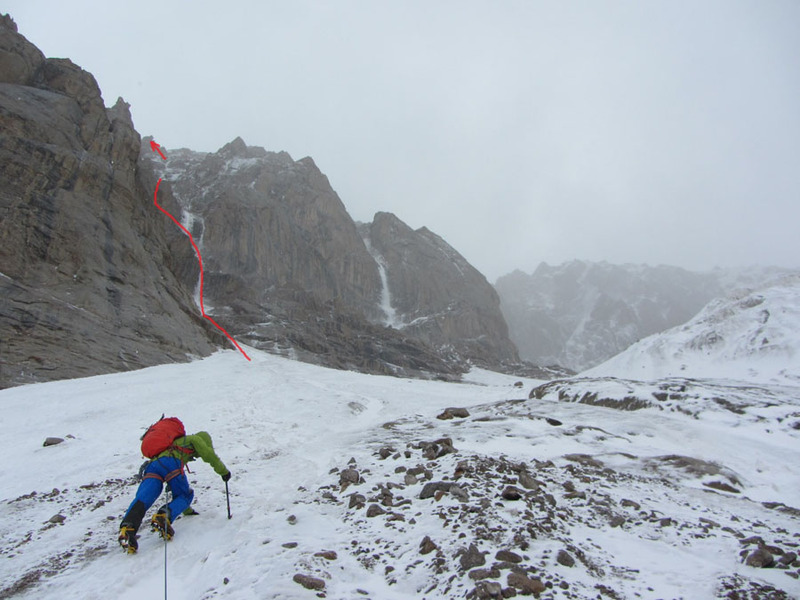 We leave our backpacks below the col and continue towards the unclimbed Kyzyl Asker west shoulder at 5632 m. We reach it via its west ridge and return to sleep at the same place as the night before. The next day we return to base camp. Having just enough time left to attempt another climb we split up into two teams. We’ve all had enough of heavy backpacks full of bivy gear and opt instead for a lightweight approach on more or less day climbs. Uroš and I leave at eleven o’clock in the evening and spent the whole night approaching the NW face of Panfilovski Division. As dawn breaks we see the horror of seracs on the eastern side of Kyzyl Asker immediately above us, so we quickly start climbing to get out of the way. 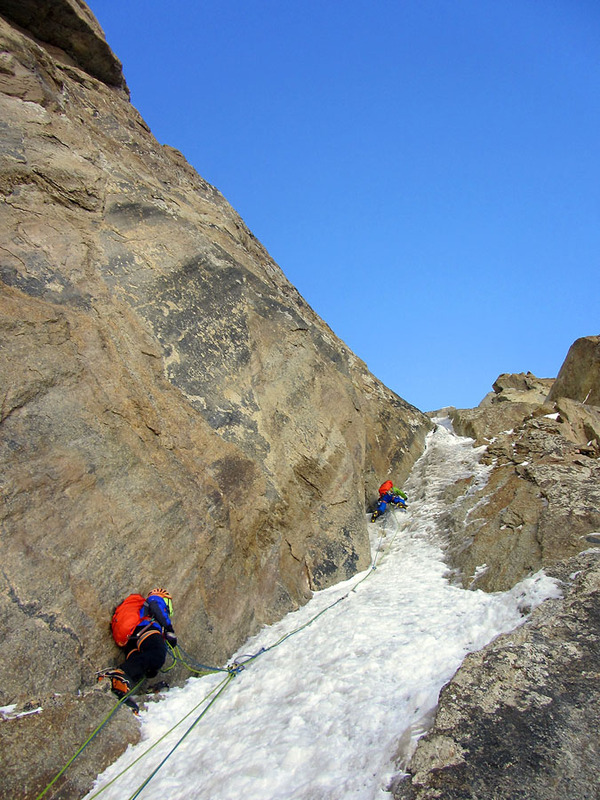 Across the lower rock barrier we find steep ice, which brings us to the first snowfield. We cross a little right, below a broken pillar. And then the surprise. Up till now, during our expedition, we only encountered unconsolidated snow, but here we have the whole wall of perfect, concrete hard neve. You can hear the squeaking of tools half a pitch away. Although it looks like this might be the first time the weather is nice throughout the climb it sneaks in a snow flurry in the afternoon. We reach the top half an hour before sunset with just enough time to check out our line of descent, before we are engulfed in clouds. We descend down the NE slope towards the col between Zuccerman and Vernyi. Tiredness increases with every hour, concentration s inversely. We get lost above some seracs left of the col, and have to double back. It's the time of new moon, so It’s pitch black. After what seems like an eternity we reach the known part of the glacier, above the ice fall between Vernyi and Gronky. Immediately we are completely lost. We’ve been on the go for over 24 hours and awake since the morning before we left base camp. A lot of snow has melted since the last time we were here, so everything looks completely different. We consider the option that we are in the wrong valley or that some sort of a natural disaster happened that completely changed the landscape. We finally get our dysfunctional brains under relative control and continue. A nice four hour walk full of hallucinations brings us back to base camp. 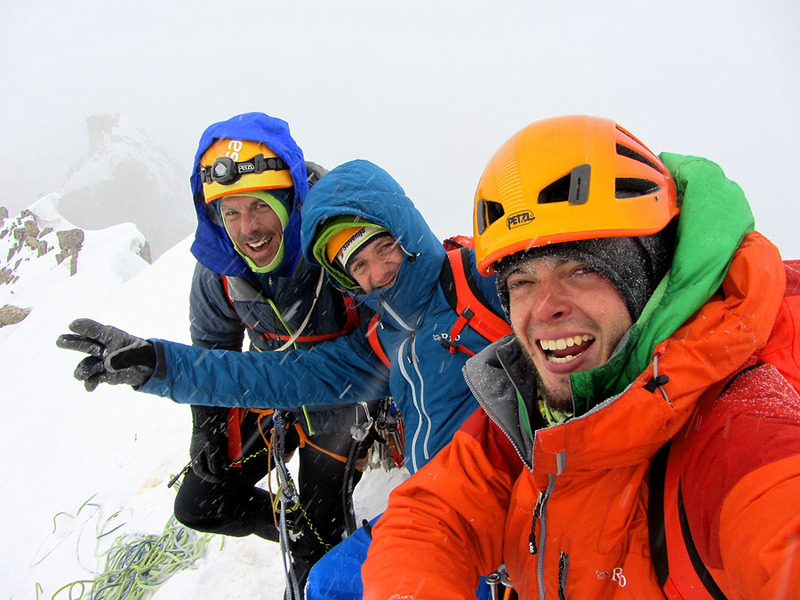 The same day that we were climbing, Anze and Matjaz climbed a line on the SW face of Pik Gronky. 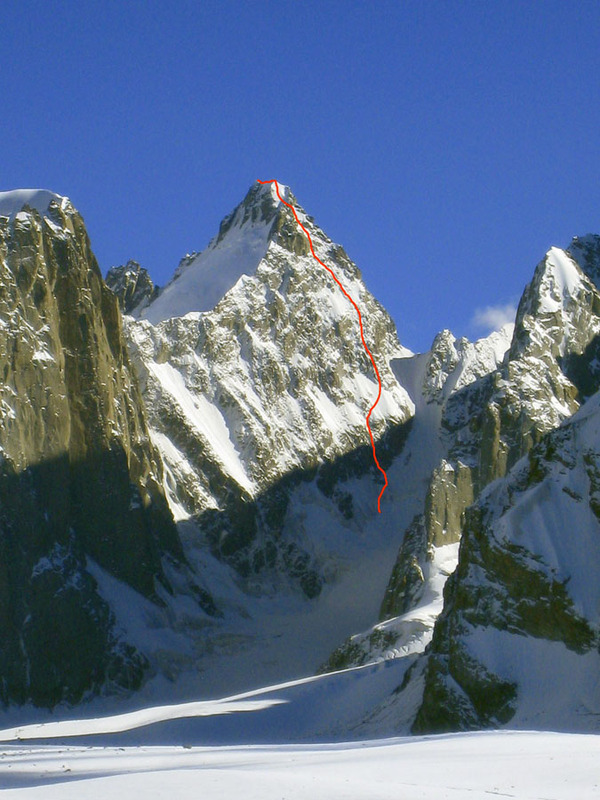 Their line followed an obvious couloirs interspersed with ice falls and required a few detours on rock. 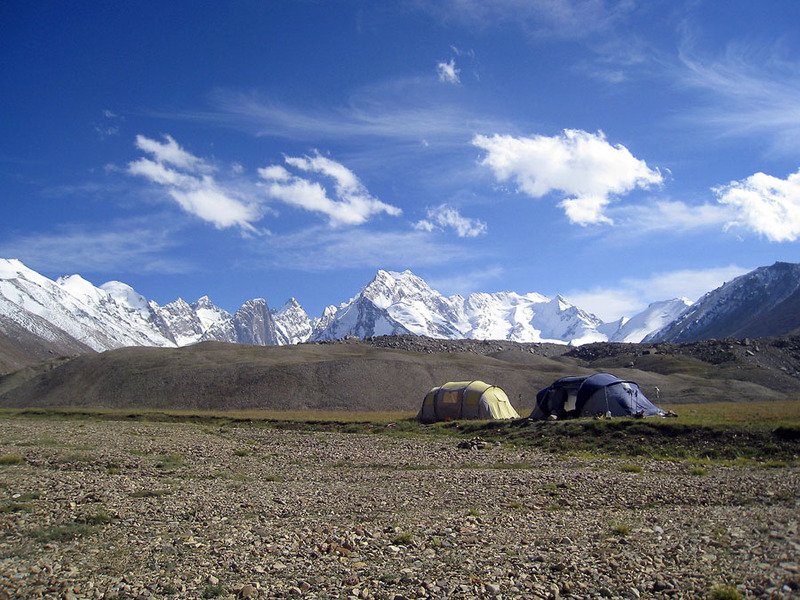 They approached, climbed the route and descended back to base camp in around 14 hours. 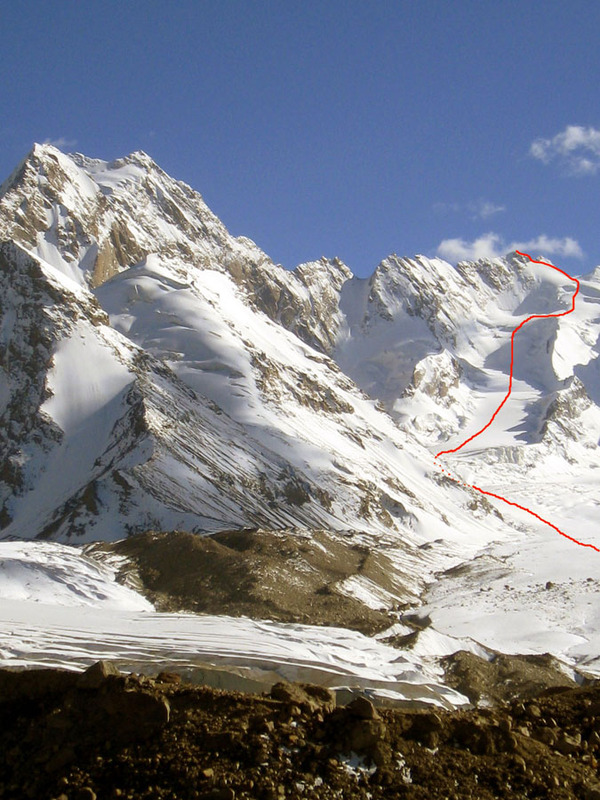 These two climbs concluded our 28 day isolation under Kyzyl Asker. During the next few days we moved our gear to the nearest “road” where we got picked up and drove back to civilisation.